The compact Soul is a front-wheel-drive only crossover and offers a cavernous cabin thanks to its boxy profile. Visibility is excellent and it’s easy to find a comfortable driving position thanks to the abundant headroom. As with most vehicles in this price range, the ride can lack refinement over uneven surfaces and more road noise enters the cabin than in larger and more opulent vehicles. Fuel economy is adequate but lags behind competitors, however driving enthusiasts will appreciate the optional 201-hp turbocharged engine. The Soul performed well in crash testing by the Insurance Institute for Highway Safety, earning a Top Safety Pick+ designation. Pricing for the 2019 Kia Soul starts from $16,490 and it competes against vehicles like the Honda Fit and Toyota C-HR. For thrifty shoppers, the 2019 compact Kia Niro is an appealing choice. The Niro is a five-passenger and front-wheel-drive hybrid vehicle with pseudo-SUV styling. Fuel economy is outstanding, achieving up to 50 MPG combined. The Niro’s main drawback is the leisurely acceleration that comes at the expense of efficiency. The Niro performed well in crash testing by the Insurance Institute for Highway Safety, earning a Top Safety Pick+ designation. The ride is fairly compliant and road noise isolation is adequate. Pricing for the 2019 Kia Niro starts from $23,490 and it primarily competes against the Toyota Prius. Offering available all-wheel-drive and more traditional crossover styling, the Kia Sportage competes with the likes of the Toyota RAV4 and Honda CR-V. With a sporty focus, the Sportage handles and accelerates well, however the ride is less compliant than some competitors and fuel economy is not class-leading. The Sportage performed well in crash testing by the Insurance Institute for Highway Safety, earning a Top Safety Pick designation. 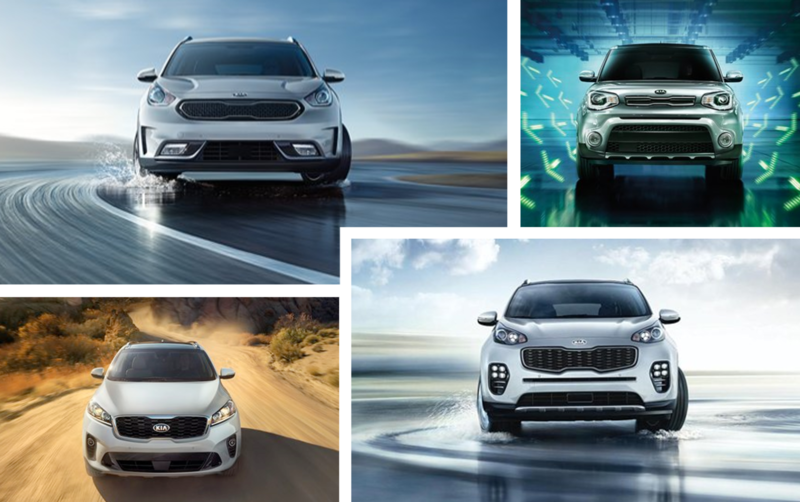 Pricing for the 2019 Kia Sportage starts from $23,750. With available all-wheel-drive and room for up to seven passengers, the 2019 Kia Sorento is a midsize crossover with a starting price of $25,990. Driving dynamics are good and the ride is quiet and comfortable, however the Sorento’s third-row seat is smaller than some competitors. The Sorento performed well in crash testing by the Insurance Institute for Highway Safety, earning a Top Safety Pick+ designation.